There once lived a family at 8507 Cunningham Drive by the name of Hodges. They used to play cards with friends on weekends, and the friends had a son, who was believed to be possessed. – So says writer Mark Opsasnick in his captivating piece The Haunted Boy: The Cold Hard Facts Behind the Story that Inspired The Exorcist. Opsasnick is a Greenbelter, born and raised, who specializes in “search-and-rescue missions down offbeat byways of the local past,” as David Montgomery of the Washington Post put it in a profile of the writer A Homer’s Odyssey. 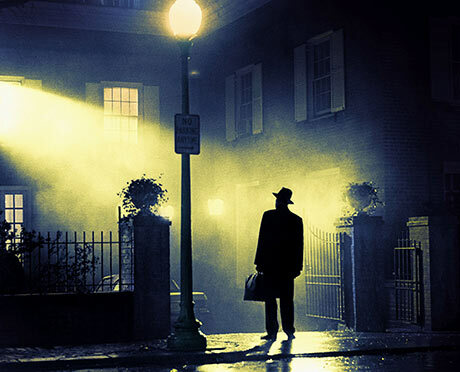 Opsasnick became interested in the story of the Exorcist in 1992 when he researched the life of famed blues-rock guitarist Roy Buchanan, who hails from Mount Rainier. The town, he says, was known for two things: the home of the great Roy Buchanan—and the alleged site of the story behind The Exorcist. After spending hundreds of hours interviewing Mount Rainier’s old time residents, Opsasnick determined that the boy was actually not from Mount Rainier but from nearby Cottage City. Once refocused, his investigation of the haunted boy gathered steam as he was able to locate people who knew the family. From his interviews of former neighbors, friends and pastors, supported by meticulous research, a different story emerges than we know from the accounts published in newspapers, books and movies.